Inflatable Pillow Bash Game Hire. Book your Pillow Bash Game Today! Try and bash your opponent off the pole with a pillow or pugil stick onto the soft inflatable below. Great fun for ages 8 - adult. Ideal for fetes, parties, fundays, etc. Our Pillow Bash Pole Jousting inflatable requires an overall operating area of 18x18ft and a height clearance of 11ft. If you have any queries, questions, or would like to make a booking please call us on the number below or click to send an enquire and we will do all we can to help. 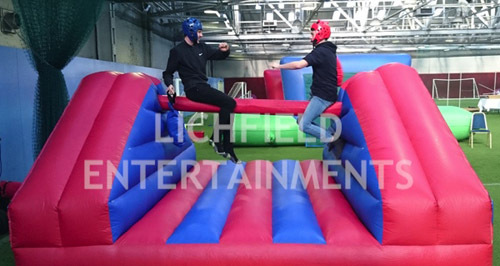 Our other inflatable jousting games worth looking at are our two different Gladiator Duel Inflatables and the brilliant Rock and Roll Jousting which may also be of interest to you.